Bad Hebrew Tattoos: Wake Up! Your Butterfly is Burning! Wake Up! Your Butterfly is Burning! Observe the colorful mess of a tattoo below. 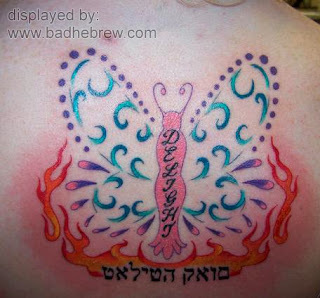 Oh yeah, it's another spiritual-wannabe Hebrew tattoo - the best kind out there! According to the victim, this Hebrew tattoo is supposed to refer to a biblical story about Jesus. In this story (Mark 5:41), Jesus resurrects a dead little girl, by saying to her "Little Girl, Wake Up". Jesus, of course, spoke Aramaic, and in it the expression is "Talitha Cumi". Our victim here, decided for some reason to get "Talitha Cumi" in Hebrew. However, instead of getting her words from a Hebrew bible, which can be easily found online, she transliterated them to Hebrew herself. Need I say that she got it wrong? The resulting Hebrew tattoo is written backwards and misspelled, not to mention that it has no real meaning in Hebrew, being an Aramaic expression. And to wrap things up, I have to mention that burning butterfly. I mean, what's up with that? I can get a burning bush reference, but don't you find burning butterflies a bit sadistic? Apparently that butterfly is delighted. At least that's what's written on it. that's pretty hysterical. WHat a mistake! I got a talitha cumi tattoo some months after I literally came from death. I want it in aremaic, but I couldn´t find it so I use it in Hebrew (right Hebrew). What did you mean when you say it had no real meaning in Hebrew? I supossed that is because of Jesus. Anyway, I'm not jew. "Talitha Cumi" is not a Hebrew expression, it's Aramaic. It's the same as writing "Talitha Cumi" in English. It's not wrong, just has its meaning in another language. I'm relief that I got it right and that I didn't have an "I'm an idiot" in my back. I got it in hebrew cause in English or Spanish (Talita cumi) was so boring. Also I love the Hebrew alphabet is pretty aesthetic and Jesus was Jew and my favorite writer was jew (in a poem in her honor the poet wrote Talitha cumi to her). Also I got it in Hebrew cause I didn´t know anyone that knows Aramaic. I have done a lot of research on how to spell Talitha Koum in Aramaic, and from my research it looks like what you have posted up there as the correct Hebrew spelling, is also a correct variant of Aramaic spelling. Aramaic has many variants and most of them look more Arabic (except the ancient one, which just looks archaic! ), but one of them actually resembles Hebrew a lot, which would mean your Hebrew spelling is the same as the Aramaic one is. In Jewish religious service, of course, We do write many Aramaic expressions in Hebrew text, but pronounce them the same as Aramaic. Examples: the "Lachma Anya" referred to in the Pesach seder, "B'oraitah" to refer to Torah during Shabbat Torah service..
Hebrew and Aramaic share the SAME alphabet. Hebrew borrowed the alphabet from Aramaic!! Ancient, ancient Hebrew looks very different from the more "modern" Hebrew that is in the Torah and the rest of the Hebrew Bible. So although the backwardsness is still a big problem, the Aramaic is most definitely not. Ah the irony! !